The x-ray diffraction patterns with inclination angle of 45° observed for 0.07YO1.5-0.93HfO2 film measured from room temperature to 600° C. (b) The integrated intensity of the 111 super-spot of 0.07YO1.5-0.93HfO2 film as a function of temperature. Ferroelectric materials have applications in next-generation electronics devices from optoelectronic modulators and random access memory to piezoelectric transducers and tunnel junctions. Now researchers at Tokyo Institute of Technology report insights into the properties of epitaxial hafnium-oxide-based (HfO2-based) thin films, confirming a stable ferroelectric phase up to 450 °C. 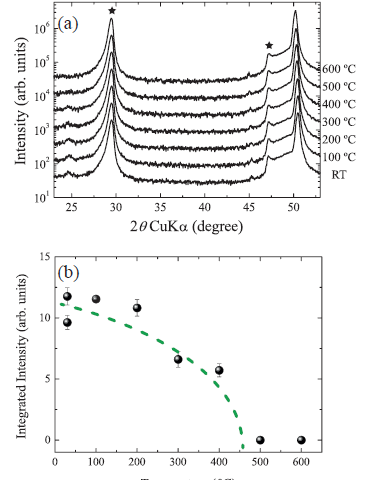 As they point out, "This temperature is sufficiently high for HfO2-based ferroelectric materials to be used in stable device operation and processing as this temperature is comparable to those of other conventional ferroelectric materials." Reports of ferroelectric properties in thin films of substituted hafnium-oxide - where some ions were replaced with other metals - have attracted particular interest because these films are already used in electronics and are compatible with the silicon fabrication techniques that dominate the industry. However attempts to study the crystal structure of HfO2-based thin films in detail to understand these ferroelectric properties have met with challenges due to the random orientation of the polycrystalline films. In order to obtain thin films with a well-defined crystal orientation, Takao Shimizu, Hiroshi Funakubo and colleagues at Tokyo Institute of Technology turned to a growth approach that had not been tried with HfO2-based materials before - epitaxial film growth. They then used a range of characterisation techniques ― including x-ray diffraction analysis and wide-area reciprocal space mapping ― to identify changes in the crystal structure as the yttrium content increased. They found a change from a low- to a high-symmetry phase via an interim orthorhombic phase with increasing yttrium from -15 % substituted yttrium oxide. Further studies confirmed that this orthorhombic phase is ferroelectric and stable for temperatures up to 450 °C. They conclude, "The present results help to clarify the nature of ferroelectricity in HfO2-based ferroelectric materials and also its potential application in various devices." The dielectric constant (high-κ) of HfO2 has previously attracted interest for use in electronics components such as dynamic random-access memory (DRAM) capacitors and is already used for high-κ gates in devices. As a result its compatibility with the CMOS processing that dominates current electronics fabrication is already known. Ferroelectric properties have been reported in HfO2 thin films with some hafnium ions substituted by different types of ions including yttrium, aluminium and lanthanum, as well as silicon and zirconium. The researchers studied HfO2 films substituted with the yttrium oxide YO1.5 as ferroelectric properties have already been reported in films of this material. Well-defined crystal orientation with respect to the substrate can be obtained in epitaxially grown films but the process usually requires high temperatures. Due to the tendency to decompose into non-ferroelectric phases HfO2 are usually prepared by crystallization of amorphous films. The researchers used pulsed laser deposition to prepare epitaxially grown HfO2-based films without destroying the ferroelectric phase. The films were grown on yttria-stabilised zirconia and were around 20 nm thick. HfO2 exists in a stable low-symmetry monoclinic phase, where the structure resembles rectangular prism with a parallelogram base. This structure changes to a high-symmetry cubic or tetragonal structured phase through a metastable orthorhombic phase. Monoclinic, cubic and tetragonal crystalline structures have inversion canter, which rules out ferroelectric properties. Therefore the researchers focused on the orthorhombic. The coexistence of several phases in HfO2 further complicates studies of crystal structure, making it yet more desirable to obtain films with well-defined crystal orientations. Prior to the current work it was still unclear whether epitaxial growth of HfO2-based films was possible. Previous work had used transmission electron microscopy and simultaneous convergent beam electron diffraction to confirm the existence of the orthorhombic phase, but more detailed analysis of the crystalline structure proved difficult due to the random polycrystalline orientation. With the epitaxially grown thin films the researchers were able to use x-ray diffraction analysis and wide-area reciprocal space mapping measurements to identify the orthorhombic phase. They then used aberration-corrected annular bright-field and high angle annular dark field scanning transmission electron microscopy to confirm that the orthorhombic phase was ferroelectric.